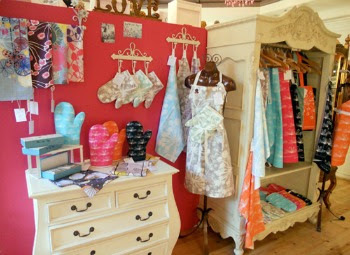 As part of our Yorkshire week, we wanted to write about Heart, a gorgeous gallery in Hebden Bridge. Who better to write about it than one of our favourite bloggers - Lisa from Mathilde Heart Manech? She's a Hebden Bridge local and she's worked at the gallery since November last year. Elizabeth kicked off Yorkshire week with a 48 hour taste of Hebden Bridge, a town I call home. Today, I'm peering through the looking-glass at Heart Gallery, a stone's throw away from all the best Hebden Bridge has to offer, set quite aptly in the 'heart' of the town. Heart Gallery is a unique independent contemporary jewellery and craft gallery, owned by Alison Bartram, celebrating craft in its all-singing, all-dancing glory. 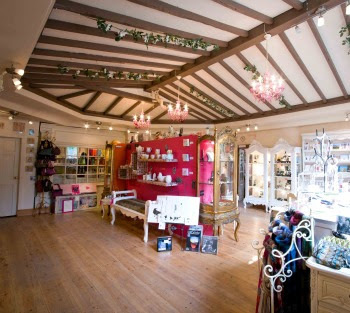 Heart Gallery seeks out very best in original design and stores it under one very pretty wooden beamed/cherub adorned roof. That's right, I said cherub. 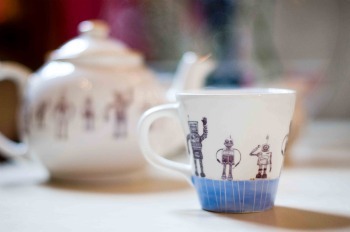 There's an array of makery from over 90 designer/makers from across the UK. So, where to begin? If you're looking to make your walls happy, I suggest the talented Yorkshire based artist and print maker Clare Caulfield and Lancashire based graphic designer Jacqui Sharples with her letterpress hand printed posters. Stunning art for all pockets equals joy! Speaking of which, maybe you prefer pocket-sized prettiness? 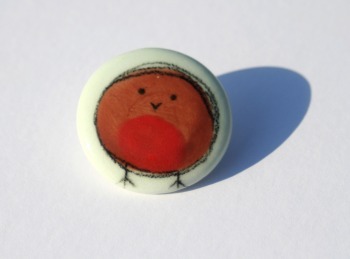 Helen Russell's ceramic Robin brooches (be still my beating heart!) make a lovely gift as do Stef Storey's tea light holders. If you're anything like me, and are constantly hunting for lovely textiles to don your kitchen (I have too many tea towels to count) perhaps owning a pinny, tea towel or matching oven gloves from Leeds based textile designer Rachael Taylor would suit? Or treat yourself to a piece of jewellery made right here in the UK from a selection of talented makers. Two of my favourites and currently on my wish list include Xuella Arnold and Claire Troughton. Somebody please make that happen! And I haven't even mentioned Rob Ryan, Black + Blum, Joseph Joseph, Di Palamo who also exhibit at Heart (to name a few). You can take a look for yourself with the upcoming 'May all your dreams come true' exhibition beginning on May 13th showcasing new and emerging talent; with work incorporating vintage stories, nostalgia, fairy tales, rhymes, folklore, sayings and dreams and story telling from Ursula Holden Gill.